The rumored Volkswagen Tiguan Coupe will apparently spawn a range-topping R version due sometime in 2018. It's being developed by Volkswagen's R division and will apparently utilize a four-cylinder, 2.0-liter turbocharged gasoline engine pushing out approximately 300 bhp and 280 lb-ft channeled exclusively to a 4MOTION all-wheel drive system through a six-speed, dual-clutch transmission. It will also have an electronic torque vectoring function and will employ a specially tuned MacPherson strut front and multi-link rear suspension combined with a four-mode adaptive damping system. This hardware arrangement will allegedly enable the Tiguan Coupe R to run the 0-62 mph (0-100 km/h) sprint in as little as 5.1 seconds. The power and performance will be matched with a more aggressive body and a bespoke interior featuring a digital instrument cluster, head-up display and a plethora of safety & assistance systems. Volkswagen is set to introduce the second generation Tiguan next month at the Frankfurt Motor Show and will be followed late next year by a seven-seat version with a longer wheelbase. The "coupe" version will join the range in 2017 whereas this flagship Coupe R is pinned for a 2018 launch. 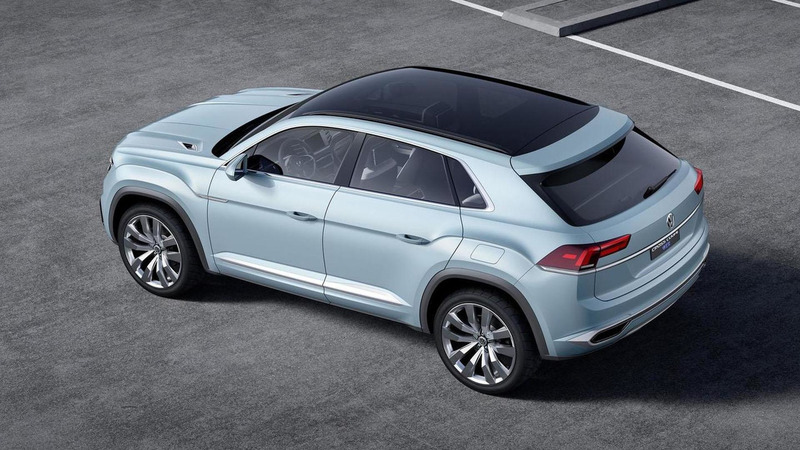 Note: 2015 Volkswagen Cross Coupe GTE concept pictured.